NOTICE: You may encounter scammers in Iquitos selling fake tours under our name. We are the only company that operates in our private property. Book directly here on the website or at our office in Iquitos inside the Green Track Hostel. Please do not trust the mototaxi and taxi drivers or the "guides" on the street in Iquitos, for your own safety and well-being. You simply cannot see wildlife in its natural habitat at any other lodge the way you can at the Tapiche Reserve. No other company has access to a property as deep in the jungle as ours. No other lodge has the same population density of healthy wild animals that we do. Even if a tourist lodge isn't close to other tourist lodges, they usually have local villages right next to or even inside the property. 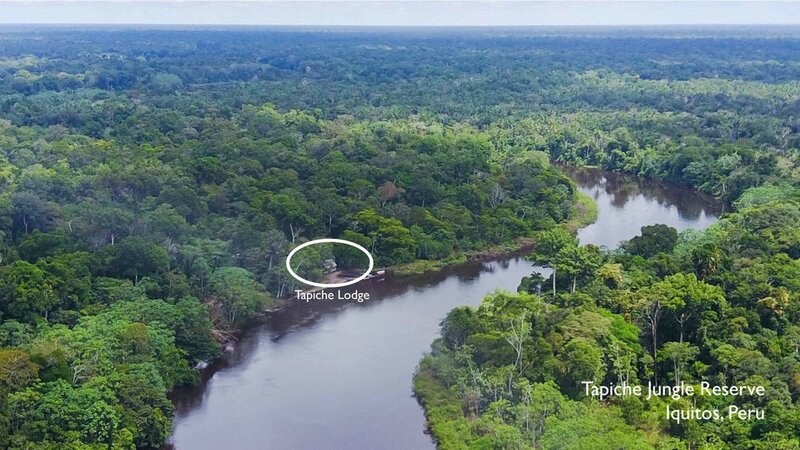 The nearest village to the Tapiche lodge is 50km away, and the nearest tourist lodge is hundreds of kilometers downstream. Some lodges are more luxurious, and what you pay for are the amenities rather than the wildlife experience. Other lodges may promise a species list that looks similar to ours. If you ask them about a rare monkey, they may say "of course, we have that, too." What they don't tell you is that you will see it in a cage or on a leash, maybe as a pet at the lodge, or perhaps in a manipulated environment, like a small section of trees where the animals are kept and fed. Be particularly wary of anyone that guarantees sightings. Some companies take you to sleep at a "lodge" just around the bend from Iquitos and then bring you back to town to visit a zoo during the day, because that's the only way you will see those animals close to Iquitos. Yes, it really happens; we've heard plenty of first-person accounts from guests at our hostel in Iquitos. They felt like they traveled far into the jungle, but that's because they went with a slow peque-peque motor at 5-10km/hr. At 404km from Iquitos, Tapiche legitimately IS far, and we use outboard engines to transport you as quickly as possible. When you visit Tapiche, it feels like you've traveled a long way because you actually have. We take you to our own private reserve, where you will never bump into other tour companies on the grounds or see a bunch of lodges clustered around the same lagoon. We take small groups (max 6 people) and keep human impact to a minimum, including the way we approach and view animals. We also have the flexibility to design and customize private trips, like sport fishing, birdwatching, mammalwatching or performing specific research studies, without needing additional permissions to be on the land. The entire 6000 hectare property is ours to roam. Some people show their "love" for animals by domesticating and dominating them (not very healthy for any relationship, is it?). We think the best way to show our love for jungle animals is to protect their habitat, so they can be free and undisturbed in their natural environment. Wild animals belong in the wild, not in cages or on leashes for the sake of pleasing humans. We don't keep pets at the lodge, we don't cut tree branches to bring a sloth down for you to hold and we don't catch snakes so that you can pose with them. So you won't get photos of yourself holding exotic animals on our trips, but you will see animals displaying their full beauty naturally, in their real homes. Sadly, the culture, politics and economy of Iquitos and the region of Loreto are quite eco-hostile because of the predominance of the logging and exotic animal trades. By coming to the jungle with us, you are playing an important role in shaping the local economy and changing the consciousness of the region. Everything you see on this site is a genuine representation of the Tapiche Reserve. There are no stock or stolen photos and no photos of species that are not actually found at the Reserve. We don't import non-endemic birds and animals just to boost interest and attract visitors. All of the photos on this site were taken during guest outings and activities around the property. All of the animals you see here are part of the unique and compelling rainforest memories of the visitors who witnessed them during their trips. We know the biodiversity at the Reserve is naturally astounding, and there is no need to exaggerate. Contact us to book your trip, or learn about how your visit contributes directly to the conservation of the forest.